Object analysis using visual sensors is one of the most important and challenging issues in computer vision research due principally to difficulties in object representation, segmentation, and recognition within a general framework. This has motivated researchers to investigate exploiting the potential identification capability of RFID (radio frequency identification) technology for object analysis. RFID however, has a number of fundamental limitations including a short sensing range, missing tag detection, not working for all objects, and some items being just too small to be tagged. This has meant applying RFID alone has not been entirely effective in computer vision applications. To address these restrictions, object analysis approaches based on a combination of visual sensors and RFID have recently been successfully introduced. This chapter presents a contemporary review on these object analysis techniques for localisation, tracking, and object and activity recognition, together with some future research directions in this burgeoning field. The innate desire for humans to have their computers and machines do exactly whatever they are able to do has, to date remained largely unfilled. While humans can effortlessly analyse and recognise an object and its activity or event, computer-based automatic systems still remain stubbornly in an embryonic state. This has lead to computer vision being one the most challenging research topic areas over the past few decades. The application of computer vision is now however, rapidly increasing due to the advancement of software and hardware technologies, including RFID (radio frequency identification), digital image analysis, artificial intelligent and robotic vision systems. Computer vision has been extensively applied in a wide range of diverse domains. These include, but are not limited to: robotic vision (Hsiao et al., 2008), autonomous car and mobile robot (Milanés et al., 2010), event detection, surveillance and tracking (Yilmaz et al., 2006; Lee et al., 2007), airport identification from aerial photographs, object-based image identification and retrieval (Veltkamp & Tanase, 2000), object and activity recognition (Smith et al., 2005; Wu et al., 2007; Bashir et al. 2007), behaviour prediction (Skinner, 1953; Pentland, 1999; Chen et al., 2004), object-based image and video coding (ISO/IEC 14496-2, 1999), criminal investigation using video footage analysis, computer graphic, and medical diagnoses (cancerous cell detection, segmentation of brain images, skin treatment, and intrathoracic airway trees) (Paul & Paul, 1993; Pham & Prince, 1999; Liu et al., 1997). An essential preprocessing step in all the aforementioned real-world examples is object detection and separation (segmentation), which both involve the core element of image analysis to retrieve and understand an event’s information in real-time (Computer vision, 2011). 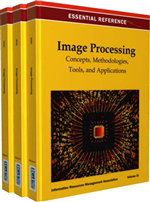 Image analysis, typically includes image segmentation, feature extraction, and object classification (Baxes, 1994). Image segmentation is the process of separating mutually exclusive homogeneous regions of interest (i.e., having similar pixel intensities) from other regions in an image. In reality, most natural objects are not homogeneous and comprise numerous objects in a hierarchical order. Furthermore, there are generally a huge number of objects and a myriad of variations amongst them. This makes object segmentation in an image an interesting if intractable task as it somewhat contradicts the above definition of object-based image segmentation. This is because there is no universally accepted standard definition of image segmentation. The properties of an object to be segmented depend on its applications and human perception, so segmenting an object is in essence an ad hoc process, which depends on the emphasis given to the set of desired properties and a trade-off among them (Paul & Paul, 1993; and Karmakar et al., 2001). To reduce the complexity of detecting and separating an object and capturing its dynamic movement pattern (i.e., motion), computer vision researchers are progressively exploiting temporal information from visual sensors such as digital video cameras (Song & Fan, 2006; Ahmed et al., 2007).